Google added a search box for your site directly within Google's search results. With the sitelinks search box, shoppers get to your content more quickly with fewer clicks and distractions. We expect more and more merchants will take advantage of this function as they become aware of its availability. Don't miss the opportunity to improve your presence on Google's search engine results page. Sitelinks Search Box removes the extra step of shoppers searching for your main site then doing a more detailed query on your site. The sitelinks search box appears for navigational queries and when relevant for users. Set a preferred canonical URL for your domain's homepage using the rel="canonical" link element on all variants of the homepage. 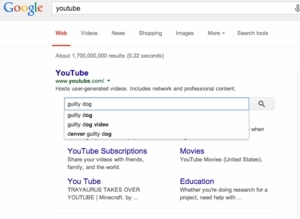 This helps Google Search choose the correct URL for your markup. No changes to 'robots.txt' are needed. Important Note From Google: After setting up the markup and canonical tags in your Yahoo store, a merchant must WAIT for Google Search algorithms to identify your site as a candidate for the new sitelinks search box. This store enhancement includes installation of Canonical Tags for your home page.